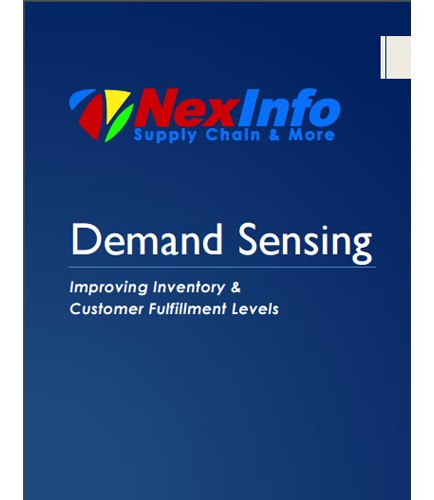 "Challenges, solutions and benefits in implementing demand sensing process"
Demand sensing can improve demand planning accuracy, reduce inventory while developing customer fulfillment levels, and also increasing profits which has been a challenging part for many companies. What is demand sensing process? How can effective Demand sensing process help improve customer fulfillment levels while also avoiding increased inventory? This whitepaper on Demand Sensing to Improve Inventory & Customer Fulfillment Levels explores the process in replacing E2Open with Oracle Demantra and discusses the positive impacts that it has brought into the Demand Planning process. Internal supply chain positions, and the inventory levels in the extended supply chain on the customer side. Accessing and Utilizing real time customer inventory information to add substantial advantage for demand planners. Challenges, solutions and benefits in implementing demand sensing process. What is Demand Side Management ? DSM, also known as Demand Side Response (DSR) or Energy Demand Management, is to alter or control customers’ demands for energy at specific times by awarding financial incentives or changing behavior through education. DSM helps in reducing system peak demand by encouraging customers to decrease energy consumption during peak hours.